This is the second in a series of stories that takes a closer look at the U.S. jobs picture. On Oct. 26, 2008, America was in the throes of its worst financial crisis in decades. Robin Scott, a 46-year-old worker at a Vandergrift, Pa., glass factory, remembers the day clearly. As is tradition in his home on Sundays, Scott had cooked up a large breakfast that included sausage, eggs and bacon. After the hearty meal, the family was settling down to watch a Pittsburgh Steelers game when the phone rang. The caller said the factory where Scott had worked for 20 years was closing down, and he didn't need to report to work the next day. "It was a complete shock. Overnight, they were gone, and we never even saw it coming," says Scott, who remembers throwing his factory time card in the garbage bin in frustration that day. The bank had decided to shut down the company's line of credit, which made it impossible for the business to operate. But Scott, who had spent a childhood watching his out-of-work father sit on the porch waiting for the coal mine where he worked to reopen, also vowed: "That wasn't going to happen to me, and I redid my resume that same day." Little did Scott know that the glass factory where he worked would be purchased by Serious Materials, an outfit that makes energy-efficient "green" building materials. The company won a mention in a speech from President Barack Obama in March this year for reopening the plant, rehiring workers and "whirling back to life" to produce energy-efficient windows. Indeed, Serious Materials bought the plant out of bankruptcy dirt cheap, and rehired some of its old workers, Scott among them. "I never thought I'd be back," says Scott, who today still handles glass for windows but now has been trained in the various methods of coating glass to increase its insulation value. In buying the factory, Serious Materials joined a small but growing movement in which shuttered Rust Belt factories are being reopened and retrofitted to produce products for the New Economy. "It's always cheaper to go into existing facilities and add equipment and bring back workers who already have factory-floor skills and just teach them a few new ones," says Kevin Surace, CEO of Serious Materials. Last year Serious Materials also acquired and reopened Republic Windows and Doors, a Chicago company that garnered national attention when it suddenly shut down, declared bankruptcy and left over 260 people unemployed just before Christmas 2008. Indeed, blue-collar workers trained in 20th-century manufacturing techniques are discovering that with a bit of tweaking and retraining, their skills can be adapted to the new requirements of producing 21st-century goods. Across the country, in old manufacturing towns, people know that the old factories and jobs are not coming back, so it's time to reinvent. Over the last decade in Michigan, home to the Big Three U.S. automakers and many of their suppliers, countless factories have closed down, and innumerable jobs have been either eliminated, shipped overseas or replaced by automation. But not all of those factories are idle today. The Michigan Economic Development Corporation, a state agency, reports that in just the last three years, more than 35 firms in Michigan have sprung up or retooled their factories to supply parts to the commercial wind industry. And a recent report by the Pew Charitable Trusts shows the clean-energy industry in Michigan is expanding, with a job growth rate of 10.7%, even while overall job growth has continued to decline in the state. Big private investors, too, are eying closed factories as cheap treasures that are ripe for the taking as lower-cost facilities that can be adapted to new uses. In November 2008, private-equity firm Patriarch Partners bought Red Shield, a century-old pulp mill in Maine that had been closed down. The renamed Old Town Fuel and Fiber mill, which reopened last year, is gearing up to produce renewable energy from the pulp. "The reopening of the Mill will put 90 workers back on the job now and a total of 170 back to work in the coming weeks," Patriarch CEO Lynn Tilton said in a release at the time. Stories of towns that are seeing a slow revival of jobs from such retrofitting are trickling in. Greenville, Mich., has a new nickname -- "Greenerville" -- because the town's once-shuttered Electrolux refrigerator plant is now occupied by about 400 workers who are building solar panels. Such reinvention is breathing new life into some old manufacturing towns, though as yet it is more the exception than the rule. For now, these companies stand as models of what's possible with a bit of out-of-the-box thinking. Pennsylvania glass technician Robin Scott says his new job is transforming his habits at home, too. "I never considered myself a tree hugger," he says, "but now I work for a green company, and I want to give a little back. I find myself turning lights off after me and recycling aluminum cans." 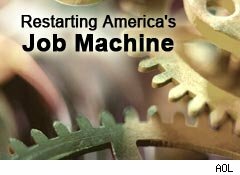 Editor's Note: This is the second installment of our six-part special report: Restarting America's Job Machine.